"I have been a patient of Dr. Duben's for over two years and I highly recommend him and all the staff. I never understood the benefits of chiropractic treatment until I went in to see him for a persistent knee injury from running and now following treatment, my understanding of its importance has changed forever. In addition to the physical adjustments, Dr. Duben has also helped improve my overall health through a truly holistic approach, which includes nutritional supplements and Neuro Emotional Technique. He has become a trusted teacher and healer by introducing me to different tools that we can employ to improve my health and I'm grateful for the care and instruction he and his team have provided. These resources have been well worth the time and financial investment because they have transformed how well I live and allow me to be a better, healthier version of myself. Thank you so much, Dr. Duben!" "I would recommend Dr. Duben to my friends and family and have done just that! I have been coming to see Dr. Duben for about 4 years. I initially came because i popped a rib out of my chest and have been a believer ever since! His work with NET and natural holistic vitamins are only a plus! His staff is great and friendly! I always look forward to my appointments!" "We have been going to Duben Chiropractic for 8 years now. It is always a great experience. The staff is friendly, and Dr Duben is always very professional and takes his time... I have referred family members and friends to Duben Chiropractic and they have all been very happy with the treatment they have received." "I have been a patient of Dr. Duben's for over 10 years with cervical and lower back issues. Most of the time, I'm just on maintenance appointments that make a huge difference in my daily life... they always work their magic with the schedule so I can get in when needed... not only is Dr. Duben an excellent chiropractor but is a caring individual who truly is working in the best interest of his patients." "I came to Duben Holistic Chiropractic Center to help with the neuropathy in my feet. After 5 laser therapy sessions I feel 30-40% better! The amazing thing is that my feet are less numb and the tingling, burning, and stiffness has subsided. My walking pattern and balance has also improved. I can now feel the ground better and the pain in my knee has diminished. I look forward to seeing what happens after my next five visits!" If you’re looking for a trusted chiropractor in Thousand Oaks, CA, you’ve come to the right place. Here at Duben Holistic Chiropractic Center, we aim to get all our patients back to a life of wellness. Whether that means managing your pain or preventing it, we’re here to help you become the healthiest you yet. We’re led by two chiropractors here at Duben Holistic Chiropractic Care in the Westlake Village area of Thousand Oaks: Dr. Alan P. Duben and Dr. Lindsay Erickson. Dr. Duben experienced the severe pain of a lower back injury firsthand. After he saw a chiropractor and received treatment for his pain, Dr. Duben decided to do the same for others. Dr. Duben went to on to go study at the Palmer College of Chiropractic West (and earned the school’s Clinical Excellence Award) and then attended CSU-Sacramento, where he focused on kinesiology. Dr. Erickson is a wellness specialist and certified practitioner who enjoys a variety of physical activities. She too learned about the restorative benefits of chiropractic care firsthand after suffering from debilitating sinus infections, which made her want to study and practice this medical field. She attended Cleveland Chiropractic College and soon after went on to attend Chiropractic College. Today, Dr. Erickson is known for her unique approaches for health restoration. If you are looking for a holistic doctor in Thousand Oaks, Dr. Duben and Dr. Erickson would be delighted to help you improve your wellness. 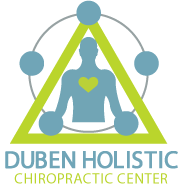 Here at Duben Holistic Chiropractic Center, our chiropractors can treat auto accident injuries, workplace injuries, sports injuries, and so much more. We offer a variety of comprehensive services to manage and treat short-term and long-term pain. Nutritional counseling — By learning which vitamins, supplements, and foods to eat for total wellness, you’ll lose weight, have more energy and feel better overall about your life. Our nutritional experts can guide you in the right direction, helping you learn which foods to eliminate and which to eat more of. Lifestyle advice — Just like nutrition is a big part of wellness, so too is an active lifestyle. That said, sometimes the exercises and sports you engage in can lead to pain. Your chiropractor can review your daily physical activities and make subtle changes and improvements to your routine. Neuro-Emotional Technique — The Neuro-Emotional Technique or NET allows you to express your emotions through chiropractic techniques and exercises. Applied kinesiology — also sometimes called muscle testing, your chiropractor may use applied kinesiology as a diagnostic tool. This testing allows them to review potential painful symptoms, emotional or mental imbalances, nutritional or chemical issues, and structural problems. Chiropractic care — through applying chiropractic techniques like manipulations, adjustments, or spinal decompression, your chiropractor can correct tissue damage, reverse improper posture, and realign the spine for less pain. 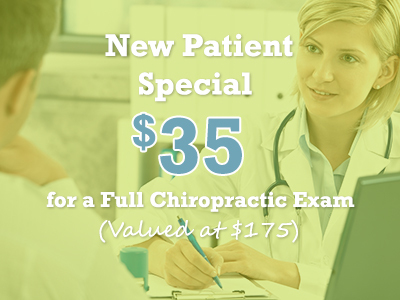 New patients receive a Full Chiropractic Exam for only $35*. If you schedule an appointment to see Dr. Duben or Dr. Erikson, you can take advantage of our new patient special here at Duben Holistic Chiropractic Center. We’re slashing our prices for a full chiropractic exam. These are regularly $175, but we’re offering them for $35. To learn more or schedule an appointment today, contact us at 805-468-4437 or visit us at Duben Holistic Chiropractic Center on 3625 East Thousand Oaks Boulevard, Suite 172. Laser therapy is a safe, drug-free conservative care technique. After suffering a serious low-back injury and almost giving up hope of recovery, a chiropractor helped Dr. Duben get back on his feet in less than a week. No wonder he joined the profession that changed his life dramatically. Dr. Lindsay Erickson has been restoring health and function to the people of the Conejo Valley. She got involved in Chiropractic Medicine because of the philosophy of the profession.